Indulge yourself with this regal faux leather hard bodied case with a magnetic front closure in classic black. 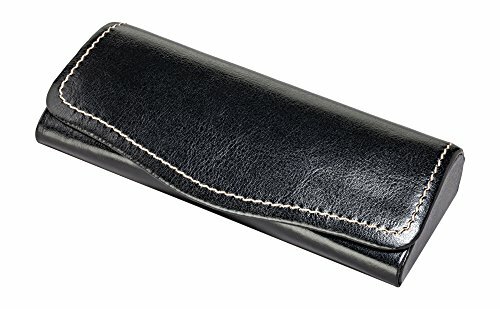 This fashionable case has a the look and feel of real leather inside and out is embellished with a single stitch of beige shiny nylon thread, meant to resemble a fine slik embroidery thread, that perfectly frames the lightly padded front flap creating a very stylish way to hold and protect your glasses. This beautiful case is lined with a super soft fabric mimicing the look and velvety nap of suede to help keep your glasses protected and getting scratched. This chic case's exterior measures 6.88 inches long, 2.38 inches high, and 1.13 inches deep. This high quality, rich looking case will make the perfect accessory to any pair of small to medium frames. If you have any questions about this product by LBI, contact us by completing and submitting the form below. If you are looking for a specif part number, please include it with your message.